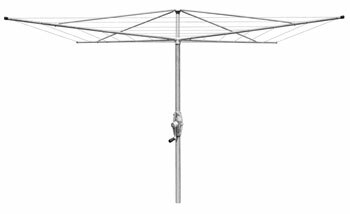 The Super range of Galvanized Fixed Rotaries offer the strength and durability associated with traditional rotary clothes lines. The Super 4 has 6 lines offering 40.4m of line space. Super 4 total packaged weight: 23.5kgs. The Super 5 has 6 lines offering 50m of line space. Outer line length: 3.49m long. Super 5 total packaged weight: 26.6kgs. The Super 6 has 7 lines offering 64.5m of line space. Outer line length: 4.12m long.